Before Duluthians dug their city’s ship canal in 1871, the only way in and out of the harbors of Duluth and Superior was the Superior Entry, a natural opening between Minnesota and Wisconsin Points. In those early years, all shipping traffic came and went via the entry, and navigating through the entry could be tricky—Lake Superior is notorious for her storms, and here at the head of the lakes, fog often blankets the ports. Over the years a series of lights guided mariners through the entry, and today the future of the most recent—built in 1912—is in question. Technically known by the U.S. Coast Guard as the Superior Harbor South Breakwater Light, and often referred to as the Superior Point Light, today’s Superior Entry Light is the last in a succession of beacons that served the entry since the late 1850s. The first began operation on the southern end of Minnesota Point in 1858, three years after the locks at Sault St. Marie opened to allow passage for larger vessels to the Head of the Lakes. But the ever-changing sand bar created a problem: the location of the natural entry shifted; within a year of the tower’s construction, it no longer stood close to the water. The lighthouse was all but rendered useless in 1871, when Duluth completed the first cut of its ship canal; within the next two years most shipping traffic at the Head of the Lakes came through the Duluth Ship Canal, bypassing the Superior Entry altogether. Because traffic through the Superior Entry became so rare, the federal government shut down the lighthouse on August 6, 1885. Today its ruins stand about a half mile from the entry. 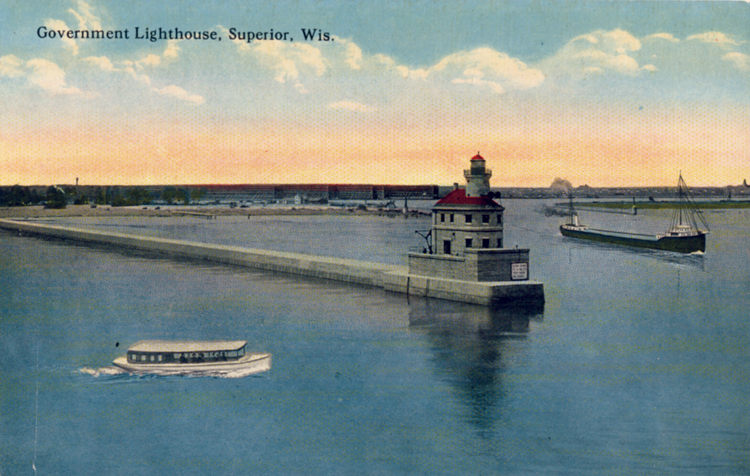 In 1889, with traffic picking up through the Superior Entry, the government commissioned a wooden pierhead beacon for the north timber pier under construction in the Superior Entry and had it fitted with the lens from the Minnesota Point Light. The 1858 Keeper’s House on Minnesota Point was refurbished to serve the keeper’s of the new Superior Entry Pierhead Light. The pierhead beacon was moved to the south pier in 1893. That same year, following recommendations for further guidance through Lake Superior’s legendary mists, a fog signal house was erected near the pier head light complete with a six-inch steam whistle. The government even constructed a duplex to accommodate the two lighthouse keepers required to run the station. In 1897 a temporary post lantern was added on the south pier 1,650 feet behind the pierhead light to further aid navigation. In 1902 a 62-foot high, pyramidal tower replaced the pierhead light and pole lantern. The structure had served as a temporary light on Devil’s Island (Lake Temagami, Ontario) before being moved to Superior. A fourth-order Fresnel lens was mounted in the lantern room. With the opening of navigation on April 1 that year, the light’s steady white beacon first shown over the water, illuminating the way to safe port. Meanwhile in Duluth, work had progressed on the federal government’s improvements to the Duluth-Superior Harbor. Part of that work involved widening the Duluth Ship Canal and replacing the wooden piers from the 1870s with modern concrete piers. The south pier would also get a new lighthouse. As the project wrapped up in 1902, the federal government turned its sights to the Superior entry with plans for new concrete piers and breakwaters. Replacing the timber pier where the wooden lighthouse stood meant moving the existing structures to the new pier, estimated to cost $20,000. Before the new pier was complete, the infamous “Mataafa Storm” of November 1905—also known as the 1905 Thanksgiving Storm”—struck Lake Superior. Twenty-six ships were wrecked and 17 others stranded—and 33 men died. The gale completely washed away the front lighthouse structure. The fog signal building sustained heavy damage, leaving the steam whistle inoperable. After making temporary repairs to the damaged fog house, workers placed a lantern on top of the building to serve as the front light. Congress appropriated the recommended funds for the project in June of 1906, but plans to improve the Superior Entry were changed to include not only two parallel piers, but also two breakwaters to protect ships from the turbulent waters at the entrance. The money Congress approved was insufficient to complete all necessary work. It took five years—until March 4, 1911—for Congress to provided an additional $25,000 for a light and fog signal on the south breakwater and three non-attended beacons marking the piers and northern breakwater. Construction of the new lighthouse began in the fall of that year, with government engineers constructing the concrete piers the light would sit upon. When the government’s work was completed in the spring, local contractors bid to build the actual lighthouse structure. George Lounsberry of Duluth submitted the winning bid, and work began in June. Later that month, tragedy struck the construction site. A derrick collapse on laborer Hans Hanson, causing a massive head injury and pinning him beneath the wreckage. That October two other navigation lights—one on the outer breakwater and another on the inner north pier were lit for the first time. It is not clear when construction on the lighthouse was complete, but it likely wasn’t in time to light the lens for the 1912 shipping season. Lounsberry and his crew built a two-story, steel-framed oval structure that stands on a concrete pier elevated more than eleven feet above the breakwater. A circular tower rises above the second story roof, capped by a metal deck. The second story originally provided living quarters for the light keepers and included a kitchen, living room, three bedrooms and a bathroom. According to a May 1913 story in the Duluth News Tribune, the light would first burn “about June 1” (research could find no definitive date of its first lighting). According to Great Lakes lighthouse expert Terry Pepper, the beacon was produced by “a fixed Fourth Order Fresnel with a rotating screen within the lens. mounted on ball bearings and driven by a clockwork motor. … Sitting 70 feet above lake level, the 2,900 candlepower lamp was thus visible for a distance of 16 miles in clear weather.” The beacon displayed five seconds of light followed by five seconds of darkness. A fog siren was added in late May 1913. The light was likely first lit by the lighthouse’s first keeper, Edwin Bishop. His service record provides a clue to the actual first lighting: he first went to work on the lighthouse on May 16, 1912—but government officials may have manned the light until that time. Over the years keepers and their assistants included Bishop, Roger Campbell, Wilbur Ranville, William Small, Hans Christensen, Angus Graham, John Kirkendal, and Frederick Penry. Campbell had a harrowing experience in February 1914, when he became trapped on an ice floe. He had been walking on the ice along the shore of Wisconsin Point, hunting rabbits, when he noticed a gap between himself and the shore of over 100 feet. He fired his rifle several times, which was enough to alert a few local do-gooders who used a rowboat to rescue the lighthouse keeper. Despite Campbell’s adventure, activity at the lighthouse remained mostly unremarkable. Minor changes were made: in 1937 the fog siren was replaced, and the following year a radio beacon was added to the station. In 1970 automation ended the keepers’ watch. Today a DCB-224 aero beacon sends its green light twenty-two miles across the lake at five-second intervals. Automation, it turns out, actually made things more interesting—at least temporarily. One local tale, which took place not long after the automation, involves a member of the U.S. Coast Guard stationed in Duluth. He was called to the Superior Entry pier one night to investigate a report that the light was out. Indeed, the light was not functioning when he approached, but by the time he got to the lantern room to investigate the problem, the light was working just fine. The same sailor returned just days later when the light was again reported out. As he approached, it began working again. After inspecting the apparatus for the second time, he still could find nothing amiss. A week later, the man was sent back one more time to investigate a reported outage. This time, he had a little chat with any keeper or assistant keeper whose spirit might still be standing watch. He told them no new crew was coming back no matter what happened or how lonely the suspected ghost keeper might become. He then told whoever (or whatever) might be there, in no uncertain terms, that it was their job to help him keep the light running properly; any assistance to that end would be appreciated. The mysterious malfunctions of the light stopped. Today, with modern navigation methods, lighthouses are being phased out across the country—and the Superior Entry Light is no exception. On May 1, 2013, the General Services Administration announced that the Superior Harbor South Breakwater Light was included on the National Historic Lighthouse Preservation Act (NHLPA) Notice of Availability list. In effect, this means that the lighthouse is available at no cost to eligible entities defined as federal agencies, state and local agencies, non-profit corporations, educational agencies, or community development organizations, for education, park, recreation, cultural or historic preservation purposes. According to Michele J. Curran, Architectural Historian with the National Historic Landmarks Program, an interested party attended an open house at the light in September of 2013. An incomplete application was submitted in December and determined to be unacceptable in January. The applicant was given time to revise the nomination but no resubmission has been received even after a subsequent extension of time. A recommendation is enroute to the National Parks Service Regional Director to list the property for sale under the terms and conditions set forth in the NHLPA.